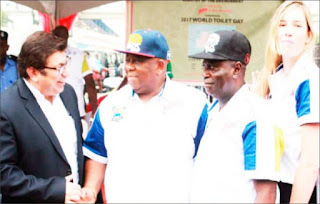 L-R: Mr. Rahul Murgai, Managing Director, RB West Africa; Dr. Babatunde Adejare, Lagos State Commissioner for the Environment; Mr. Babatunde Hunpe, Special Adviser to Lagos State Governor on Environment, and Aliza Leferink, Marketing Director, RB West Africa, during 2017 World Toilet Day ceremony sponsored by RB in Lagos. Following growing incidence of water-borne diseases, cholera, dysentery, typhoid and polio, leading toilet cleaning brand, Harpic took a sensitisation programme on the treatment and proper disposal of sewage or wastewater to Ojodu Berger, a Lagos suburb to mark this year’s World Toilet Day (WTD). Due to lack of safe water, poor sanitation and hygiene, 842,000 people die yearly, some experts said during the sensitisation programme. According to them, 1.8 billion people use source of drinking water contaminated with faeces, putting them at risk of contracting cholera, dysentery, typhoid and polio. The event was organised by Harpic, one of the country’s leading toilet cleaning brand from Reckitt Benckiser in health, hygiene and home care products in partnership with the Lagos State Ministry of Environment to mark this year’s WTD. The experts said that wastewater is roughly composed of 99 per cent water and one per cent suspended, colloidal and dissolved solids. According to the statistics by World Health Organisation (WHO), today, 4.5 billion people live without a household toilet that safely disposes of their waste. The United Nations health body also said that approximately 315,000 children dies every year through poor sanitation and unsafe water caused by Diarrhoea. “In addition, a large number of women and children in Nigeria are exposed to the risk of contracting infections due to lack of access to sanitation which impacts on health, dignity, and safety,” it added. At the sensitisation exercise, Dr. Samuel Babatunde Adejare, the Representative of the Lagos State Governor and Commissioner for the Environment, commissioned the renovated public toilets at Ojodu Berger to the joy of community members, travellers and artisans. Speaking at the event, the Managing Director, RB West Africa, Mr. Rahul Murgai, emphasised the commitment of Harpic towards the World Toilet Day. “Harpic, one of RB’s power brands has consistently advocated the importance of having access to clean toilets and that waste water, poor sanitation and issues like open defecation can create potential health problems, especially among women and children who are highly susceptible to infections and diarrhoea” he stated. “Today is World Toilet Day with the theme wastewater and globally, over 80 per cent of all the wastewater from our homes, cities, industry and agriculture flows back to nature without being treated or reused – polluting the environment, and losing valuable nutrients and other recoverable materials. “Due to population growth, accelerated urbanisation and economic development, the quantity of wastewater generated and its overall pollution effects are increasing globally,” Adejare said. Also speaking at the event, Mr Abiodun Bamgboye, the Permanent Secretary, Ministry of the Environment, stated; “We educate sewage management authorities on proper disposal and recycling of wastewater as wastewater management is being seriously neglected, and grossly undervalued as a potentially affordable and sustainable source of water, energy, nutrients and other recoverable materials. “It therefore needs to be seen as a resource, rather than a burden to be disposed of. There are many treatment processes and operational systems that will allow us to use wastewater to meet the growing water demand in growing cities, support sustainable agriculture, and enhance energy production and industrial development, therefore contributing to a more sustainable, efficient and equitable water use worldwide. Mrs. Bamigbaiye-Elatuyi Omotola, the Regional Marketing Manager, RB West Africa also spoke on the opportunities to address potential health issues arising from poor sanitation. The adequate attention to solid waste, waste water and also industrial accumulated waste management can help avoid the chain of infection. Over the years, Harpic has been providing awareness and education to Nigerians on the importance of better hygiene practices and improved health through prevention of open defecation. This year’s World Toilet Day with the theme “Waste Water” focused on the link between sanitation and proper disposal of wastewater to draw global attention to the importance of sanitation as a job opportunity. The goal is to reduce open defecation and promote better hygiene practices in the prevention of diseases such as Diarrhoea and toilet infections, especially in women and children.